Pergola or Arbor? You Make The Call. What Is a Pergola? Unlike an arbor (which is always free-standing) a pergola can be either attached to an existing building or be self-supporting. Generally speaking, it is an open overhang with supports attached to or placed next to a home or other structure — or it can exist on supports of its own. Pergolas are much more substantial structures than arbors though, like arbors, they can also be used to grow climbing plants, from trumpet vines to bougainvillea. What Is a Pergola Used For? 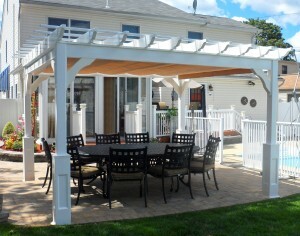 Because a pergola is much larger than an arbor, it is perfect structure to create an outdoor room. Pergolas (when attached to a home) often provide shade for decks or patios, keeping those areas comfortable even during the most intense heat of the day. The great thing about a pergola’s open roof is that, while it helps keep areas shady and cool, your space is always filled with some sunshine. 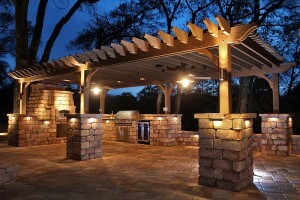 A pergola also defines your outdoor space so that it can easily become an outdoor kitchen or dining area. Many modern pergolas employ a retractable screen or protective cover, offering additional shade and even some protection from the rain. Accessories like lights and curtains can further help to define the space within the pergola as an outdoor room. What Is an Arbor? An arbor is defined in the dictionary as “a shelter of vines or branches or of latticework covered with climbing shrubs or vines.” It seems, then, that arbors and plants are intertwined – literally! However, while an arbor serves as a great environment for coaxing vines and climbing plants to create a wall or archway, it can also simply be a freestanding structure. In fact, that’s one of the hallmarks of an arbor: it IS freestanding. Rather than jutting out from a house or garage, an arbor usually shades a gate, walkway, or even a bench. Another defining characteristic of an arbor is that it is often covered with lattice. While the sides of an arbor may look somewhat open if there is no plant covering, at its heart, an arbor is able to support growing plants. 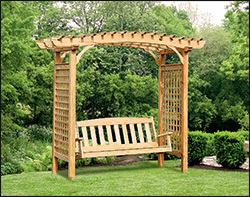 An arbor can come in a traditional arched variety or have a flat top, which is another reason they are often confused with the traditionally flat-topped pergola. Often an arbor is only is only a few feet wide, making them ideal entryways or dramatic focal points but they have negligible use as common use outdoor spaces. What is an Arbor Used For? 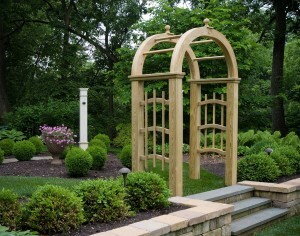 An arbor is used as a design element, but most often is also used for gardening purposes. 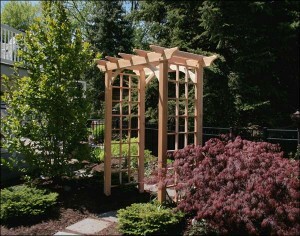 An arbor can add height to an area where there are no tall structures. It does this in a couple of ways. First of all, an arbor is almost always tall enough to walk beneath (seven feet is a pretty standard height for an arbor) and an arbor has lattice work on the top and sides and that lattice work allows climbing plants to grow successfully, often creating even greater height on an already tall structure. Arbors also can create much- needed shady spots (with successful plantings) where one can rest and relax. Arbors are often used as a covering for garden gates to highlight the way into or out of your garden and yard. Pergola Options. Now that you know the difference between pergolas and arbors you probably want to start exploring your style options. At Fifthroom.com we have a wide variety of pergolas made of several different materials including: red cedar, white cedar, rough cut cedar, treated pine, aluminum, fiberglass and vinyl in both free standing and wall mount styles. And, everything is totally and utterly customizable. We’re proud to say we get customer raves about our pergolas: “A great quality product,” “The perfect arched garden pergola,” “Very impressed with the product and the personal attention I received,” etc. etc. etc. Arbor Options. When it comes to arbors, we’ve got you “covered,” too! Arbors offer unique opportunities for flowering climbers and make a lovely architectural statement in your garden. Like our pergolas, these beauties come in a wide variety of materials including: red cedar, white cedar, treated pine, vinyl, poly lumber, aluminum and recycled plastic. You can choose a simple, classic design, like our treated pine Harmony arbor (and it’s on sale right now!) or get as elaborate as you like by adding benches or swings to your arbor. 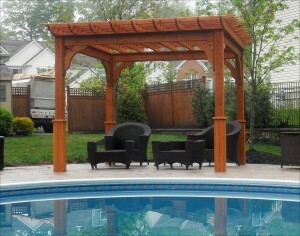 Your outdoor space will benefit so much from a pergola or arbor or both! Take your garden or backyard to the “next level” this summer. Every moment you spend outside you’ll be so glad you did.